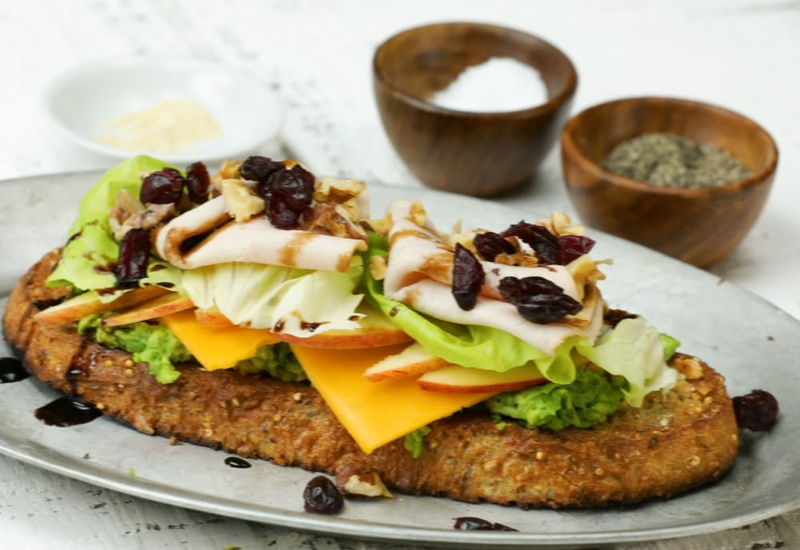 This lunchtime idea brings turkey, cheese, and apple to freshly made avocado toast. Start by seasoning an avocado half with salt, pepper and garlic powder. Toast up your favorite crusty bread and spread with the mashed avocado. Top with high-quality cheddar cheese and a few thin slices of apple. Add some Bibb lettuce leaves and your favorite deli-sliced turkey breast. Finish with a drizzle of balsamic glaze, some toasted walnuts and a few dried cranberries! Do you love avocado toast? Do you love Thanksgiving? This recipe is a great way to use holiday leftovers! Per Serving: 957 calories; 29g fat; 146.8g carbohydrates; 43g protein; 96mg cholesterol; 1002mg sodium. Big fan of this recipe, though be prepared to eat it open faced, it's too big and messy to eat. I wish my mom packed me these turkey sandwiches when I was a kid! These are definitely the grown up version, so filling and delicious! My boyfriend is totally spoiled when I make him this, and of course, I add extra turkey meat! I love a good avocado toast! I'm not a fan of cranberries so I used pomegranate seeds instead. The cheddar, balsamic glaze and turkey go together very well. Good for a light lunch or after a workout for fuel. I always have a hard time finding "rustic style" bread, so I used plain wheat toast and it came out great. I also skipped the cranberries, they're not really my thing. Simple changes, delicious results! I used chicken sausage instead of turkey, and it was super delicious. I didn't do the cranberries or walnuts either, just the toast with avocado, sausage, and a fried egg with runny yolk in the middle. It was fantastic.